SINISTER REALM – A Metal Odyssey Exclusive Interview! SINISTER REALM – Traditional Heavy Metal, aka Classic Metal, reigns supreme in 2011. With hordes of legendary Traditional Metal bands leading the never-ending charge, to this very moment as you read this, there are a good many new, hungry and talented Metal bands out there that revere Metal’s history of tradition. Sinister Realm is one such Metal band. Led by founding member and bass guitarist John Gaffney, Sinister Realm is a band that I have admired and loudly recommended, since my first thorough listen of their second studio album The Crystal Eye (Shadow Kingdom Records) which was released this Summer. Calling Allentown, Pennsylvania their Metal home, Sinister Realm is a band amassing a loyal following of Metal fans from Trexlertown, Pennsylvania to points worldwide. Sinister Realm has created some incredible Traditional Metal that MUST be heard to understand my Metal point. It’s not everyday that I bellow with such Metal pride about a rising Metal band such as Sinister Realm. Alex Kristoff (vocals), John Risko (guitar), John Kantner (guitar), Chris Metzger (drums) and John Gaffney’s bass illuminates my eardrums with their utmost Metal talent and respect for the Metal they play. Traditional Metal goes much farther than “the look” of denim and leather. The sound, lyrics, vibes and attitude I hear on The Crystal Eye are all-encompassing of what Traditional Metal is all about in my Metal world. Overall, Sinister Realm represents where Metal was so many years ago and where it is today, in all of its powerful glory. Sinister Realm is the real Metal deal here, fellow Metalheads. John Gaffney, bass guitarist, songwriter and founder of Sinister Realm. Stone: Can you share the goals and mindset of the band as a whole, while recording “The Crystal Eye”? John Gaffney: With the new album our goal was pretty simple, to take a step forward from our first album. I think my mindset when I started writing the music was to just make sure that every song was as good as I could make it. I wanted to make sure there was a good amount of variety also, some fast songs, some slow and mid tempos one. I know all the other guys really wanted to make this one a good follow-up to our debut record. The goals of our band in general are to always get better and keep pushing forward, to play and perform better, to get our music out to as many metal heads as possible and in general to just keep growing as a band. Stone: How is the songwriting and lyrics shared among the band? John Gaffney: All the music and lyrics are written by me but the other guys definitely add their personalities to the songs. I demo everything out in a very rough format with a drum machine and me singing and the other guys take that and add their own thing to it. When I write I really think about the guys and their personalities on their instruments and I write to their strengths so that the songs feel natural to them and not like I’m asking them to play or sing things that don’t fit who they are as musicians. Even though I write the music, the strength and identity of Sinister Realm is really in the collection of all the individual players, we work and sound really good together in my humble opinion. Stone: Just how important is the history of Metal to Sinister Realm? John Gaffney: Very important, especially the early years of metal, I’m very much a Heavy Metal scholar. I’m always reading about heavy metal and searching out old classic bands that I may not have heard of yet. I’m a very big fan of the “golden” years of classic metal as I like to call it, 1980 to about 1984. The albums that Priest, Maiden, Dio, Sabbath, Ozzy, Mercyful Fate and many others released during those years are some of my absolute favorite heavy metal albums of all time. With the band we really try to pay our respects to those great metal classics, when we perform or work on new music all those bands are in the back of our mind, they are our benchmarks if you will, we really want to do this music justice and we consider it a great honor to be called a traditional metal band. Stone: How did Sinister Realm and Shadow Kingdom Records find each other? John Gaffney: Well…a bit of history on the band I guess is in order here. I used to be in a band called Pale Divine, when I left the drummer Darin McCloskey called me and said he wanted to work on some of the ideas I had that were never used in Pale Divine. As things progressed it started sounding really good and we decided to get a proper singer and record a demo, so into the picture came Alex. I played guitar and bass on the original demo, Darin played drums and Alex sang. Darin knew Tim from Shadow Kingdom Records and ran into him when Pale Divine was playing in Pittsburgh, he passed our demo on to him and he really liked it. At the time the demo was really making the rounds on the internet and we got a few offers from other labels but we really liked where Shadow Kingdom was at the time and the other types of bands they had so we went with them. After we got signed we added our current guitar player John Kantner and a lead player and quickly recorded our self titled full length. Right after that Darin had to leave for personal reasons and our original lead player was asked to leave so we brought Chris Metzger in on drums and John Risko on lead guitar. Lots of gigs followed and we’ve just released our second album “The Crystal Eye”. That’s our history in a nutshell. Stone: What venue that Sinister Realm has played to date exhibited the most rabid Metal fans? John Gaffney: We played a Doom Metal festival in Wisconsin this Summer that was really cool, we have a lot of great local fans who really support us also so it’s hard to pick one venue, we have fun where ever we play. Stone: What is the biggest hurdle that confronts a Metal band in 2011? John Gaffney: Trying to stand out above the bottomless sea of bands that are out there right now. The Internet is a great thing because anybody can get a band together, put something out and promote it. The Internet is also a bad thing because anybody can get a band together, put something out and promote it..haha. It works both ways. There are just so many bands out there now and the playing field is so so crowded that it’s really difficult to get yourself to stand out of the pack. It takes a lot of hard work and dedication and sticking to and believing in what you’re doing. Selling CDs is very difficult nowadays because there is a lot of illegal downloading and not many people are even into buying CD’s anymore. I’m old-fashioned and still listen to vinyl, in fact I have a rather large Metal vinyl collection and consider that to be one of my hobbies. Stone: My favorite song on “The Crystal Eye” is the title track. That song just psyches me out blindly! Which one is yours and why? John Gaffney: I like “The Crystal Eye” also. I think I like it because it’s a great title track and has a really good “epic” feel to it. All the guys sound great on it, I especially like John Risko’s lead solo on that one, just super cool! I love the way that guy plays. It’s just a song that came together really nicely if you know what I mean. If I had to pick a close second I would say “Signal the Earth”. I like the feel and groove of the song and I was proud of my lyrics on that one, it’s about a guy sent on a mission in space, now’s he’s trapped in his space ship alone, seeing and hearing things and trying to signal the earth that he needs help. Plus there’s a bass solo in that song… ha ha. Stone: Is there a “dream band” Sinister Realm wants to be contacted by to support on a major tour? John Gaffney: Any of the big classic bands like Priest, Maiden, Sabbath would be a dream. 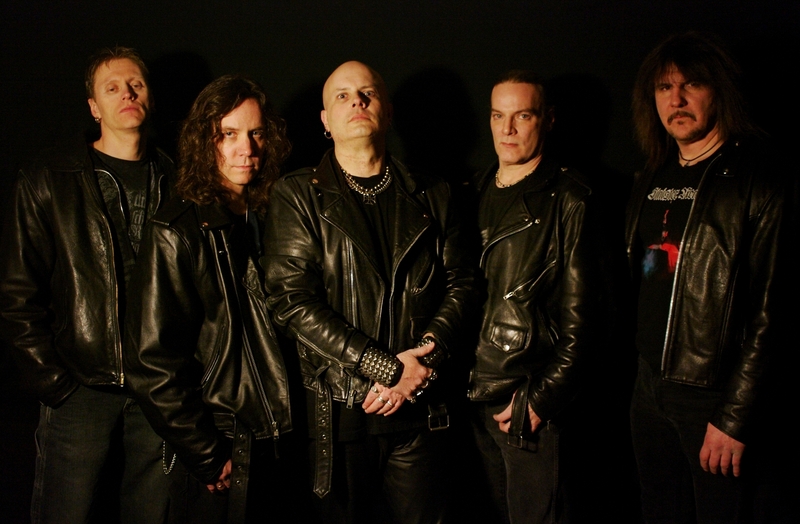 I’m also a big fan of Candlemass so I would love to be able to play in Europe or Scandinavia with them. Stone: How many guitars do you own and which one is your favorite? John Gaffney: Bass is my main instrument but I do own an early 80s gibson flying V guitar and a Fender telecaster guitar. As for basses, I have three. A 1978 Fender jazz bass, a 1984 Fender precision and a Geddy Lee model Jazz bass. 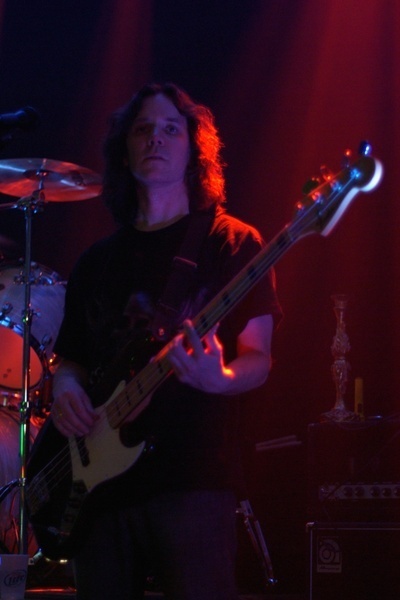 For Sinister Realm I use the Geddy Lee bass, it has a great aggressive grinding growling sound. I use an Ampeg Svt-Pro 2 and Ampeg 4-10 cabinet live for amplification. 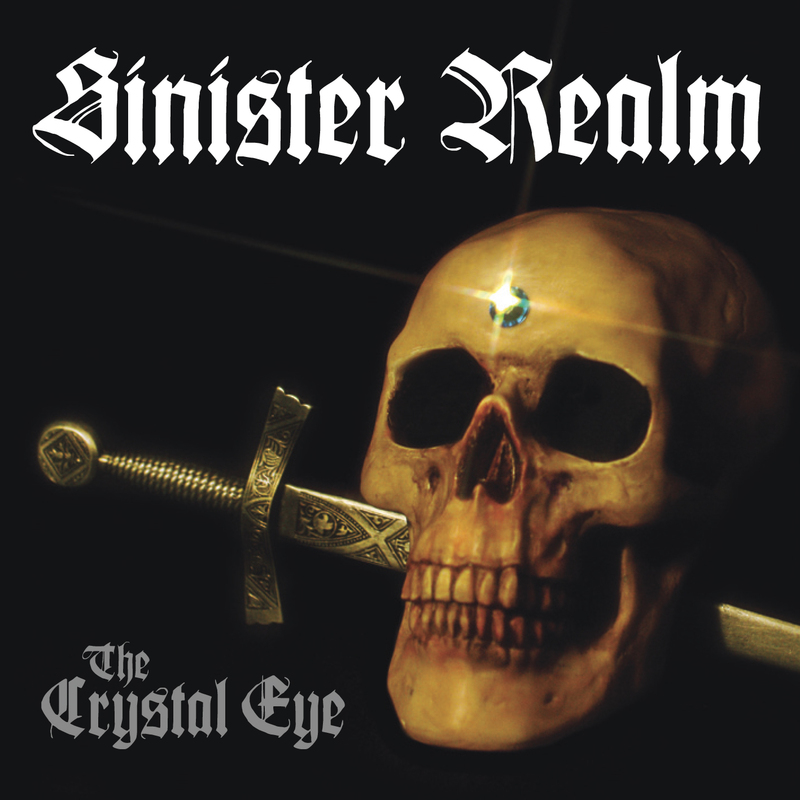 Stone: The talents and musical skills of Sinister Realm are obviously heard by my ears on “The Crystal Eye”. What are the other intangibles required to create such a powerful album of Traditional Heavy Metal? What is Sinister Realms “Metal X-Factor”? John Gaffney: There’s a lot of X factors, I really couldn’t pin it down to one thing. I tell the guys all the time that it’s the little things that make a great band. Playing in tune, having good equipment, having good players and a good singer. If I had to point to one thing though I would say at the end of the day it’s songs and how their delivered. The average listener is not a musician, they are just fans of the music, so the only thing that is really important to them is if they like the songs or not. There are plenty of bands through history who had great players that never went anywhere because their songs just weren’t that good. It’s why the Beatles have lasted forever, they had great songs! So for Sinister Realm I think the X-factor is a combination of everyone’s professionalism and individual personalities wrapped around the songs, that is our “X-Factor”. This entry was posted on September 3, 2011 at 12:21 am and is filed under classic metal, Heavy Metal, heavy metal news, metal music, metal odyssey, Music, rock music, rock music interviews, rock music news, traditional heavy metal, traditional metal with tags classic metal, Heavy Metal, heavy metal albums 2011, metal music, metal odyssey, rock music news, sinister realm, sinister realm interview, the crystal eye album, traditional heavy metal, traditional metal. You can follow any responses to this entry through the RSS 2.0 feed. You can leave a response, or trackback from your own site.